Get more information on the Madison. Our Madison floor plan is a slightly smaller version than the modified Madison 2.0. It features space, privacy, function, and comfort for any family, appealing to all types of home buyers. This open floor plan is sure to impress your friends and family. Entering in through the covered porch, the floor plan opens into a wide open living space. The l-shaped kitchen features an incredible island and sink, while coming outfitted with the latest GE slate appliances. Look further and a hidden walk-in pantry allows even the busiest cook to hide their wares and supplies. 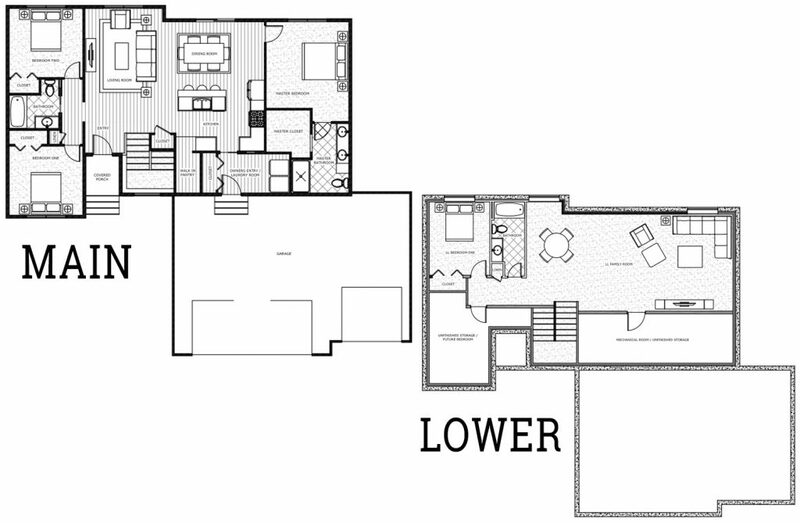 The Madison floor plan features 3 bedrooms upstairs and 1 downstairs. Let the opportunities fill you as you tour this finely finished area. No home is complete without a king’s garage. The garage is large enough to fit the largest of family vehicles or trucks, but will still leave you with enough space to store your outdoor gear. Interested In The Madison Floor Plan? Building beautiful custom homes in the Cedar Valley and beyond.